Please click here to download an informational letter regarding political campaign sign regulations. 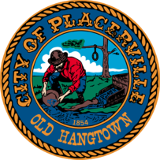 These regulations apply to signs associated with all campaign activity within Placerville City Limits. Please direct questions regarding City Limit lines to the Planning Division at (530) 642-5252. Please click here to review the City's Municipal Code. Sign Regulations may be found by navigating to Title 10, Chapter 4, Section 17.